I picked this up because a former coworker recommended it. 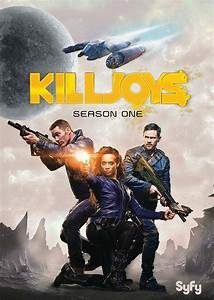 I was looking for a new Sci-fi series that was like Firefly, Battlestar Galactica, or Eureka. The DVD cover was quite attractive and intrigued me. Plus it was produced by the SyFy channel. The show has many similar traits to Firefly, Star Wars, and other science fiction entertainment. I really like space operas with action, adventure, mystery, a lil romance, and fun. This show has all of those elements yet somehow they put their own unique spin on it. It will feel familiar to regular fans of Sci-fi but not exactly, the same plot twists, friendships, villains, rebellions, romance, robots, etc. A good thing (or bad depending) is that the show was not produced in the USA. This means it is short; there are only 10 episodes per season. You don’t have to carve out 2 months of your life to binge all four seasons. Since every episode ends with at least one cliffhanger, I would suggest you checkout all 4 seasons on DVD at one time. I would recommend this to people who like a bit of magical mystery with their typical episodic adventure space show. Click to Request Season 1-4 on DVD!